This article is about the Native American tribe originating in the Great Lakes region. For the tribe in Florida, see Mayaimi. This article is about the tribe as a whole. For the relocated branch, see Miami Tribe of Oklahoma. For notable people from the city of Miami, see List of people from Miami. The Miami (Miami-Illinois: Myaamiaki) are a Native American nation originally speaking one of the Algonquian languages. Among the peoples known as the Great Lakes tribes, it occupied territory that is now identified as Indiana, southwest Michigan, and western Ohio. By 1846, most of the Miami had been removed to Indian Territory (now part of Oklahoma). The Miami Tribe of Oklahoma is the only federally recognized tribe of Miami Indians in the United States. The Miami Nation of Indiana is an unrecognized tribe. The name Miami derives from Myaamia (plural Myaamiaki), the tribe's autonym (name for themselves) in their Algonquian language of Miami-Illinois. This appears to have been derived from an older term meaning "downstream people." Some scholars contended the Miami called themselves the Twightwee (also spelled Twatwa), supposedly an onomatopoeic reference to their sacred bird, the sandhill crane. Recent studies have shown that Twightwee derives from the Delaware language exonym for the Miamis, tuwéhtuwe, a name of unknown etymology. Some Miami have stated that this was only a name used by other tribes for the Miami, and not their autonym. They also called themselves Mihtohseeniaki (the people). The Miami continue to use this autonym today. Early Miami people are considered to belong to the Fischer Tradition of Mississippian culture. Mississippian societies were characterized by maize-based agriculture, chiefdom-level social organization, extensive regional trade networks, hierarchical settlement patterns, and other factors. The historical Miami engaged in hunting, as did other Mississippian peoples. During historic times, the Miami were known to have migrated south and eastwards from Wisconsin from the mid-17th century to the mid-18th century, by which time they had settled on the upper Wabash River in what is now northwestern Ohio. The migration was likely a result of their being invaded during the protracted Beaver Wars by the more powerful Iroquois, who traveled far in strong organized groups (war parties) from their territory in central and western New York for better hunting during the peak of the eastern beaver fur trader days. The Dutch and French traders and, after 1652, the British fueled demand. The warfare and social disruption contributed to the decimation of Native American populations, but the major factor were fatalities from infectious diseases for which they had no immunity. Lithograph of Little Turtle is reputedly based upon a lost portrait by Gilbert Stuart, destroyed when the British burned Washington, D.C. in 1814. When French missionaries first encountered the Miami in the mid-17th century, the indigenous people were living around the western shores of Lake Michigan. The Miami had reportedly moved there because of pressure from the Iroquois further east. 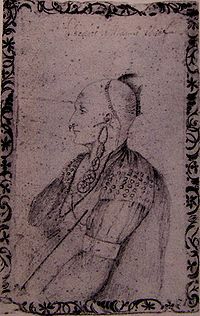 Early French explorers noticed many linguistic and cultural similarities between the Miami bands and the Illiniwek, a loose confederacy of Algonquian-speaking peoples. In 1696, the Comte de Frontenac appointed Jean Baptiste Bissot, Sieur de Vincennes as commander of the French outposts in northeast Indiana and southwest Michigan. 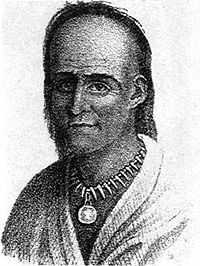 He befriended the Miami people, settling first at the St. Joseph River, and, in 1704, establishing a trading post and fort at Kekionga, present-day Fort Wayne, Indiana. By the 18th century, the Miami had for the most part returned to their homeland in present-day Indiana and Ohio. The eventual victory of the British in the French and Indian War (Seven Years' War) led to an increased British presence in traditional Miami areas. Shifting alliances and the gradual encroachment of European-American settlement led to some Miami bands merging. Native Americans created larger tribal confederacies led by Chief Little Turtle; their alliances were for waging war against Europeans and to fight advancing white settlement. By the end of the century, the tribal divisions were three: the Miami, Piankeshaw, and Wea. The latter two groups were closely aligned with some of the Illini tribes. The US government later included them with the Illini for administrative purposes. The Eel River band maintained a somewhat separate status, which proved beneficial in the removals of the 19th century. The nation's traditional capital was Kekionga. 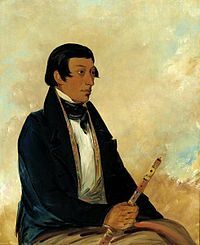 1780 October — Agustin Mottin de La Balme (French, from St. Louis) headed a raid of Detroit. Stopped and destroyed Kekionga. La Balme withdrew to the west, where Little Turtle destroyed the raiders, killing one third of them, on the 5th of November. Miami Nation of Indiana flag. The Miami had mixed relations with the United States. Some villages of the Piankeshaw openly supported the American rebel colonists during the American Revolution, while the villages around Ouiatenon were openly hostile. The Miami of Kekionga remained allies of the British, but were not openly hostile to the United States (US) (except when attacked by Augustin de La Balme in 1780). The U.S. government did not trust their neutrality, however. US forces attacked Kekionga several times during the Northwest Indian War shortly after the American Revolution. Each attack was repulsed, including the battle known as St. Clair's Defeat, recognized as the worst defeat of an American army by Native Americans in U.S. history. The Northwest Indian War ended with the Battle of Fallen Timbers and Treaty of Greenville. Those Miami who still resented the United States gathered around Ouiatenon and Prophetstown, where Shawnee Chief Tecumseh led a coalition of Native American nations. Territorial governor William Henry Harrison and his forces destroyed Prophetstown in 1811, then used the War of 1812 as pretext for attacks on Miami villages throughout the Indiana Territory. The Treaty of Mississinewas, signed in 1826, forced the Miami to cede most of their land to the US government. It also allowed Miami lands to be held as private property by individuals, where the tribe had formerly held the land in common. At the time of Indian Removal in 1846, those Miami who held separate allotments of land were allowed to stay as citizens in Indiana. Those who affiliated with the tribe were moved to reservations west of the Mississippi River, first to Kansas, then to Indian Territory in Oklahoma. The divide in the tribe exists to this day. The US government has recognized the Western Miami as the official tribal government since the forced divide in 1846. Migration between the tribes has made it difficult to track affiliations and power for bureaucrats and historians alike. :XXV Today the western tribe is federally recognized as the Miami Tribe of Oklahoma, with 3553 enrolled members. 1790 Gen. Harmar marches on Kekionga to punish the Miami, Delaware, and Shawnee villages. On October 17, Harmar found the seven villages deserted. The rear guard, left to destroy the returning villagers, was defeated by Little Turtle's warriors. 1791 Gen. Arthur St. Clair moves on Kekionga. Little Turtle destroys the US Army (1400) near the future Fort Recovery. Kentucky Militia destroy Eel River villages. 1793 December — General Anthony Wayne moves to Fort Recovery to prepare to destroy Kekionga. 1794 August — Fort Defiance (Defiance, Ohio) built on the Maumee River, site of deserted Shawnee village of Blue Jacket. 20 August Battle of Fallen Timbers, Blue Jacket loses to Wayne. Mississinewa towns become the center of the nation. 1809 – Gov. William Henry Harrison orders destruction of all villages within two days' march of Fort Wayne. Villages near Columbia City and Huntington destroyed. 17 December – Lt. Col. John B. Campbell ordered to destroy the Mississinewa villages. Campbell destroys villages and kills women and children. 18 December, at second village, Americans repulsed and return to Greenville. 1810 July – US Army returns and burns deserted town and crops. 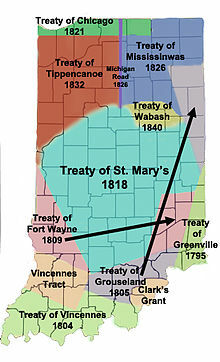 1818 Treaty of St. Mary's (New Purchase Treaty) - lose south of the Wabash — Big Miami Reservation created. Grants on the Mississinewa and Wabash given to Josetta Beaubien, Anotoine Bondie, Peter Labadie, Francois Lafontaine, Peter Langlois, Joseph Richardville, and Antoine Rivarre. Miami National Reserve (875,000) created. 1818 Eel River Miami settle at Thorntown, northeast of Lebanon). 1826 Mississinewa Treaty — loose between the Eel and the Wabash to create a right of way for the canal. Eel River Miami leave Thorntown, northeast of Lebanon, for Logansport area. 1838 Potawatomi removed from Indiana. No other Indian tribes in the state. Treaty of 1838 made 43 grants and sold the western portion of the Big Reserve. Richardville exempted from any future removal treaties. Richardsville, Godfroy, Metocina received grants, plus family reserves for Ozahshiquah, Maconzeqyuah (Wife of Benjamin), Osandian, Tahconong, and Wapapincha. 1846 – October 1, removal was supposed to begin. It began October 6 by canal boat. By ship to Kansas Landing Kansas City and 50 miles (80 km) overland to the reservation. Reached by 9 November. 1872 Most reserves were partially sold to non-Indians. 1922 All reserves were sold for debt or taxes for the Miamis. A number of places have been named for the Miami nation. However, Miami, Florida is not named for this tribe, but for the Miami River in Florida, which is in turn named after the Mayaimi people. ^ West Fork of the White River was known to the native Miami-Illinois peoples as Wapahani, meaning ″white sands″ or Waapi-nipi Siipiiwi, meaning ″white lake river″. ^ Both the Piankashaw and the Wea are known in historic sources as Newcalenous because of their close relationship. ^ The common tribal name Wea was shortened from Wiatanon by the British. The spelling Ouiatanon was used by the French with the letters "Ou" representing the sound of "W". ^ 2011 Oklahoma Indian Nations Pocket Pictorial Directory. Archived 2012-05-12 at the Wayback Machine Oklahoma Indian Affairs Commission. 2011: 21. Retrieved 30 June 2013. ^ Costa, David J. (2000). "Miami-Illinois Tribe Names". In Nichols, John (ed.). Papers of the Thirty-first Algonquian Conference. Winnipeg: University of Manitoba. pp. 30–53. ^ a b c Kubiak, William J. (1970). Great Lakes Indians; A Pictorial Guide. Baker Book House Company. ^ a b c d Tanner, Helen Hornbeck (1987). Atlas of Great Lakes Indian History. University of Oklahoma Press. ISBN 9780806120560. ^ a b c d e f g h Rafert, Stewart (2016). The Miami Indians of Indiana: A Persistent People, 1654–1994. Indiana Historical Society. ISBN 9780871951328. ^ Emerson, Thomas E.; Lewis, R. Barry (2000). Cahokia and the Hinterlands: Middle Mississippian Cultures of the Midwest. Champaign, Illinois: University of Illinois Press. p. 17. ISBN 978-0-252-06878-2. ^ Carter, Life and Times, 62–3. ^ "Meramec River Name Origin - Ozark Outdoors Riverfront Resort". ozarkoutdoors.net. Retrieved 22 March 2018. ^ Torp, K. "piankeshaw Indian Village of Vermilion County, IL". genealogytrails.com. Retrieved 22 March 2018. ^ Baxter, Nancy Niblack (1987). The Miamis!. Emmis Books. ISBN 0-9617367-3-9. ^ "Walking Myaamionki: Quelle für Siedlungs-, Flüsse, Orts- sowie Eigennamen der einzelnen Bands". myaamiahistory.wordpress.com. ^ Anson, Bert (2000). The Miami Indians. Norman, Oklahoma: University of Oklahoma Press. p. 13. ISBN 0-8061-3197-7. ^ "Vincennes, Sieur de (Jean Baptiste Bissot". The Encyclopedia Americana. 28. Danbury, Connecticut: Grolier. 1990. p. 130. ^ Sisson, Richard; Zacher, Christian; Cayton, Andrew, eds. (2007). The American Midwest: An Interpretive Encyclopedia. Indiana University Press. p. 1749. ISBN 0-253-34886-2. ^ a b Drury, Augustus Waldo (1909). History of the City of Dayton and Montgomery County, Ohio, Volume 1. S. J. Clarke Publishing Company. p. 57. Magnin, Frédéric (2005). Mottin de la Balme, cavalier des deux mondes et de la liberté (in French). Paris: L'Harmattan. ISBN 2-7475-9080-1. Wikimedia Commons has media related to Miami (tribe). "Miami Indians" . Catholic Encyclopedia. 1913. "Miami, a tribe of North American Indians of Algonquian stock" . Encyclopædia Britannica (11th ed.). 1911. "Miamis" . The New Student's Reference Work . 1914. This page was last edited on 14 February 2019, at 18:21 (UTC).